San José State University and the City of San José came together to form a unique partnership to offer joint library services to San José, CA residents and SJSU students and faculty at the Martin Luther King, Jr. Library. e design partnered with SK Consulting, a marketing and strategic consulting firm, to create a brochure for this collaborative library. 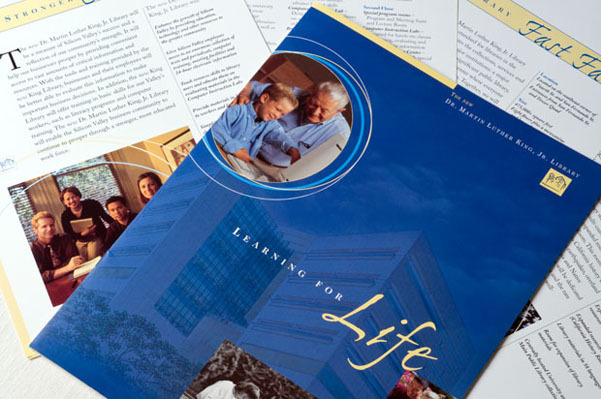 This was an extensive project that included the design of a 16-page brochure and pocket folder plus several inserts. We also worked directly with Sharon Hall and art directed all of the original photography. The images have also been used in other projects for the library. Today, the collaborative library sits in the heart of downtown San Jose and serves as a major university’s library and also a library for a thriving city. With 30 award-winning art installations, Martin Luther King, Jr. Library is a true gem for the City of San Jose!